The SISIS Auto Rotorake MK 5 is a self-propelled, heavy duty scarifier and de-thatcher for removal and control of thatch on fine and other quality turf. It is ideally suited to a range of applications from sports field maintenance to synthetic turf maintenance, lawns and amenities. 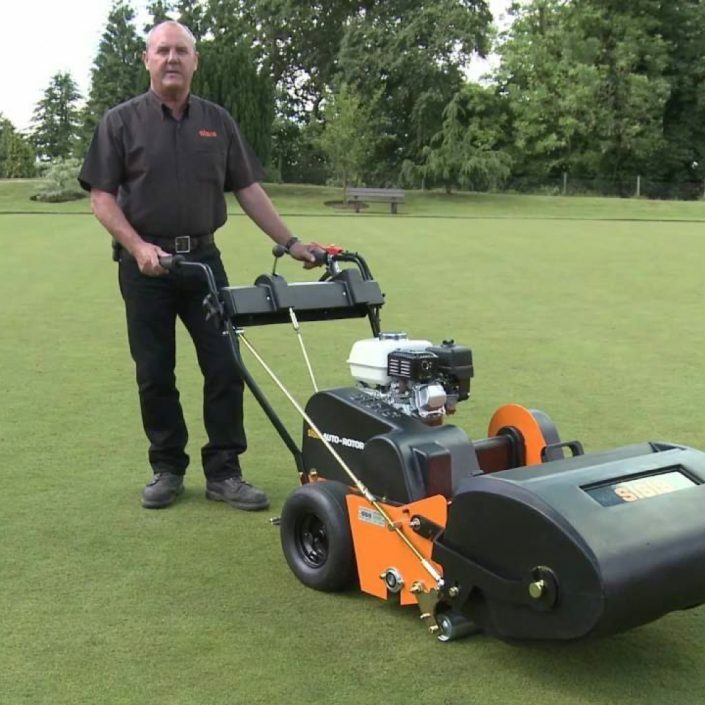 It can be used as a bowling green scarifier and a cricket scarifier for maintaining artificial pitches, bowling greens, croquet lawns, tennis courts, cricket pitches, golf courses, lawns and gardens. Scarification is important to encourage germination and the Auto Rotorake Mk. 5 will serve all your scarifying needs including removal of lawn thatch to provide top class lawn treatment. Its contra-rotating reel has specially designed tipping blades for clean, consistent cut and maximum thatch removal to ensure excellent lawn care when the time comes to scarify. Working width of 50cm (20ins). Contra-rotating reel with specially designed tipped blades for clean, consistent cut and maximum thatch removal. Alternative blades for light scarifying. Optional Brush Reels, Rolaspike Reel. Depth of cut adjustment control is mounted on the handle to enable depth to be set whilst moving forwards. User-friendly, operator presence controls designed for maximum operator safety. 6.5hp petrol engine with an independent drive to wheels and reel. Careful weight distribution, slick tires, and full differential ensure ease of turning and minimal surface marking. Optional artificial surface Brush Reels. 50cm wide synthetic brush reel, used throughout the year for debris collection and clean up. Also used prior to mowing to stand grasses up and improve cut quality. Speak to our very knowledgeable Sales Team today! Browse our range of used Sisis equipment.